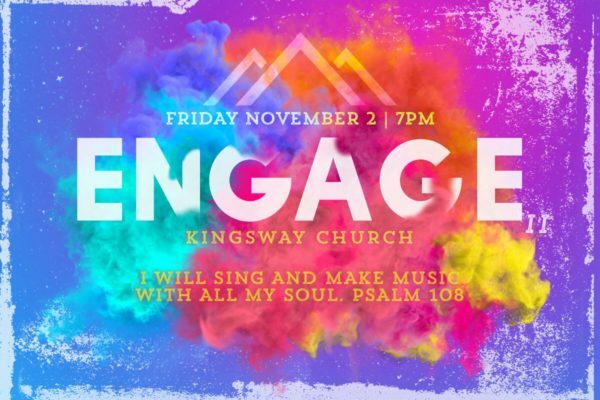 Engage nights are a simple and relaxed night to gather His family, be inspired and celebrate the Lord with music. They’re a chance for God’s children to be together and let loose; celebrating Him with songs of praise. Approximately 90+ minutes of praise & worship music. We want to engage with the Lord and do it together! Everyone is welcome! There will be familiar songs to our Kingsway family and new songs as well. We want to give everyone an opportunity to know all the songs beforehand. This way we can all come ready that night to make a joyful noise together. So we’ve included a playlist below.